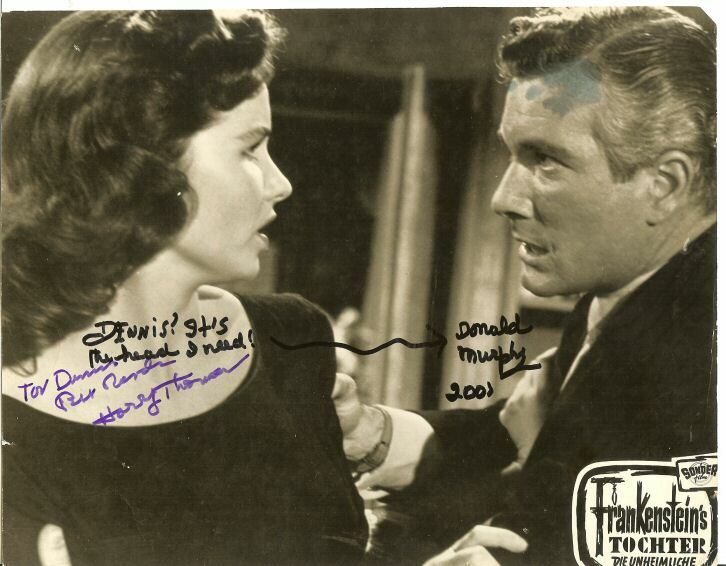 German lobby card signed by Harry Thomas and Donald Murphy. When Harry signed this, he mentioned that it was his idea to add some grey to Donald's hair. 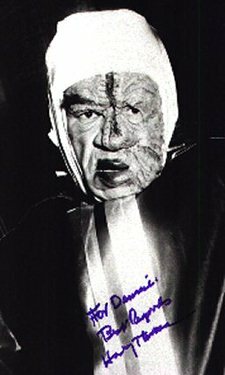 Harry Thomas designed and created this new look for the Frankenstein monster. Harry had to transform this attractive young actress into a terrifying monster. Here is the finished mask as it appeared in the movie. Here is the mask as it appears today in my collection. 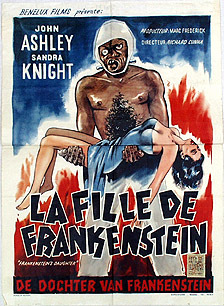 Here is the movie poster for the Belgium release of Frankenstein's Daughter. I often showed posters like this to Harry and he was both amazed and happy to see his work was released overseas. Harry once told me several stories about this film: "It was my idea to show Sandra Knight in the different stages of transformation as she stumbled around her bedroom. 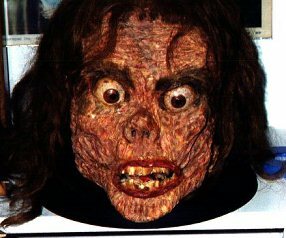 Regarding the popular story that the monster was to be female... they never gave me a script or instructions to make the monster as a woman. After making up the monster I heard one of the actors speak his line 'Isn't SHE beautiful?' I thought he had blown the line, but he was correct. The monster (first picture on this page) was supposed to be a female. I hurried to put some lipstick and a blonde wig on the monster (the wig was not used in the finished film). I could have done more but the director wouldn't give me the time. The producers were not upset and they hired me back for Missile To The Moon. 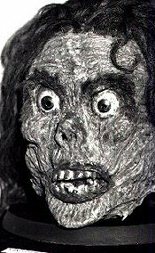 I was also rushed with the final scene of Dr. Frankenstein getting a face full of acid. The Director kept telling me to hurry and I told him just a minute.... it will look great. I finished that makeup in about 2 minutes and it looked great"
Perhaps the images above will put the story to rest. 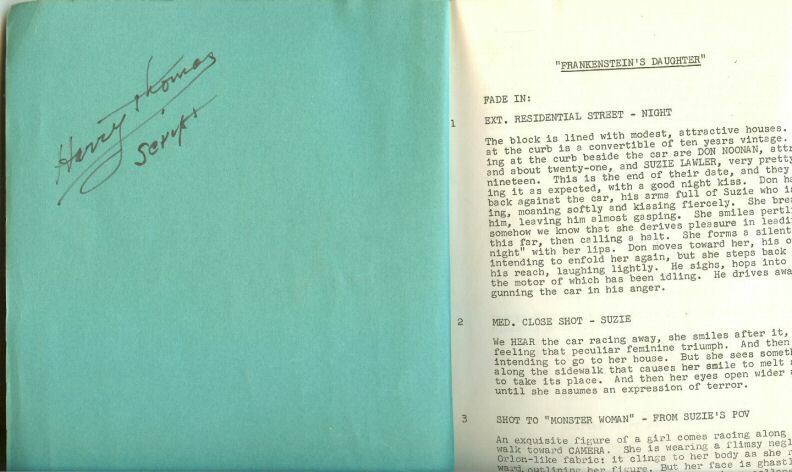 Photos of Harry's script from Frankenstein's Daughter. I bought it from Harry in the mid-1990's. These comments are copyright The Astounding B Monster and are used with permission. Q: The story has been told and retold, elaborated on and exaggerated. Please set the record straight: What was the deal with Harry Thomas' misguided makeup? RICHARD: Holy Samoly! That story got screwed up from the beginning. Harry Thomas did a fabulous job creating the monster about two hours before his (her) first scene. As critical as the creature was to the film, for some unknown reason, we never gave a thought to what "she" should look like. As hard as that is to believe, it is true. It would take a miracle to make Sally Todd ugly as a monster, so we hired lovable Harry Wilson to play the role. 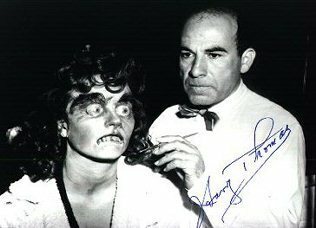 We had no money for a day's prep by Harry Thomas to create a lady monster out of Wilson, so part of his daily make-up chores was to create Frankenstein's Daughter one morning before the monster was to appear on stage. (Not necessarily the first day of filming.) I haven't the foggiest idea what I expected, but between setups a few minutes before the creature was to be filmed, someone went taa-da and out came the monster. Q: Be honest -- what was your reaction when you first saw the monster? RICHARD: I blinked my eyes and was in complete shock. I may have cried. I don't know what I expected, but that wasn't it. Harry Thomas had done a fabulous job with what he had in the time that he had. 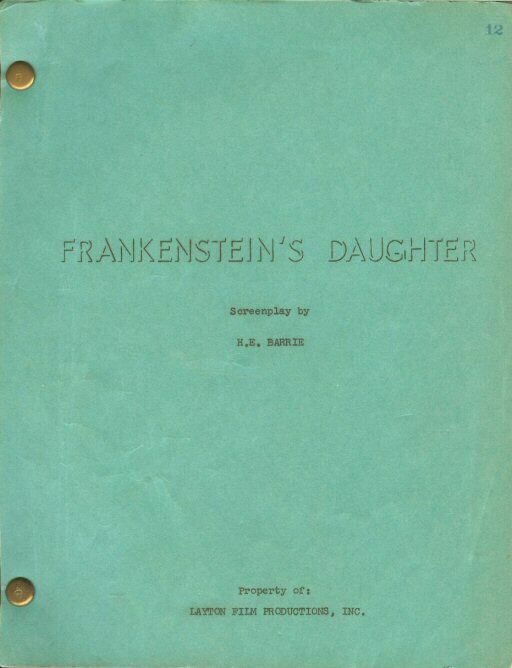 We just hadn't given the Daughter of Frankenstein enough preparation, time or thought. 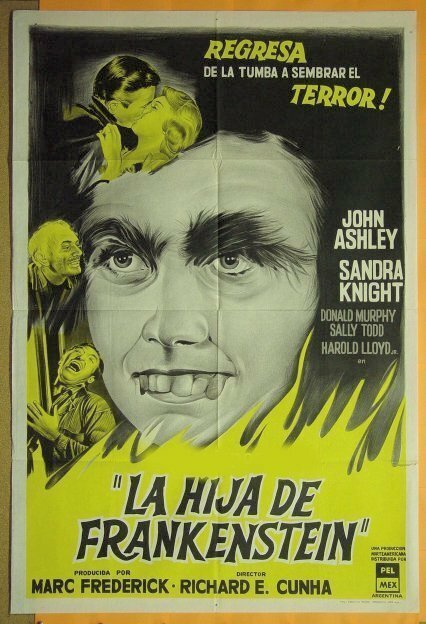 What the hell does the daughter of Frankenstein made from a squashed Sally Todd look like? I thought to myself, 'Not like this,' but the show must go on so we put her in front of the camera and kept filming. Never was any blame put on Thomas for his creation. The fault was entirely on poor preproduction planning. I remember the crew applauding when Harry proudly presented his creation. Q: Any particular embarrassing occurrences during filming that you'd care to relate? RICHARD: No, not embarrassing, but a credit to Harry Thomas. 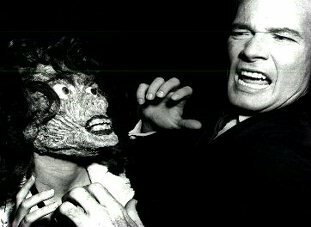 When he created the creature that Sandra Knight played, he made her up without permitting her to see what was going on until he had finished. When she saw herself in the mirror for the first time she actually went into shock. She was so horrified at how she looked that she got hysterical and cried and it took some twenty expensive minutes and the company first aid person to calm her down before filming could continue.